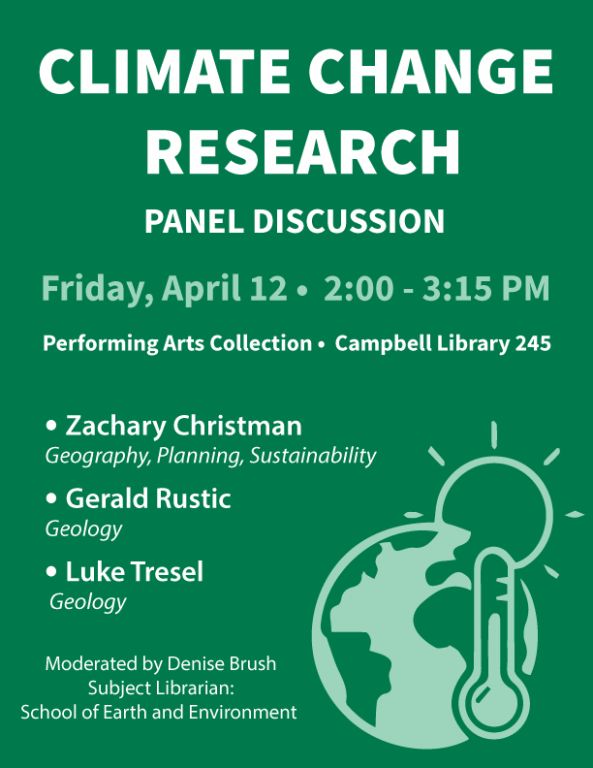 Campbell Library is hosting a panel discussion on Climate Change Research on Friday April 12 from 2:00 – 3:15 pm in the Performing Arts Collection (located on the 2nd floor, Room 245). The faculty panelists are Zachary Christman (Geography, Planning and Sustainability), Gerald Rustic (Geology), and Luke Trusel (Geology). Librarian Denise Brush will be the moderator and will ask questions about their research, how it advances our knowledge of climate change, what students should know about climate change, and how they can learn more about it (through courses, programs, and research opportunities at Rowan University).